A University of Alabama swimmer died Monday after saving his girlfriend during a Southern Tornado. Anna Rae Gwarjanski, a senior UA swimmer, posted on her Twitter account that Servati "died a hero. Held up a concrete wall long enough for his girlfriend to get out from under it before it collapsed again on him." On Instagram, Gwarjanski added, "You were a beautiful person, inside and out. A true southern gentleman." A business major, Servati was on the Dean's List, and as a backstroker and freestyler, had been a U.S. Open qualifier. (In high school he set records in both of those strokes.) He was involved with Big Brothers Big Sisters. He was a Christian. His coaches and friends described him as "as stallion," "a golden child," "a servant," and "a hero every day." 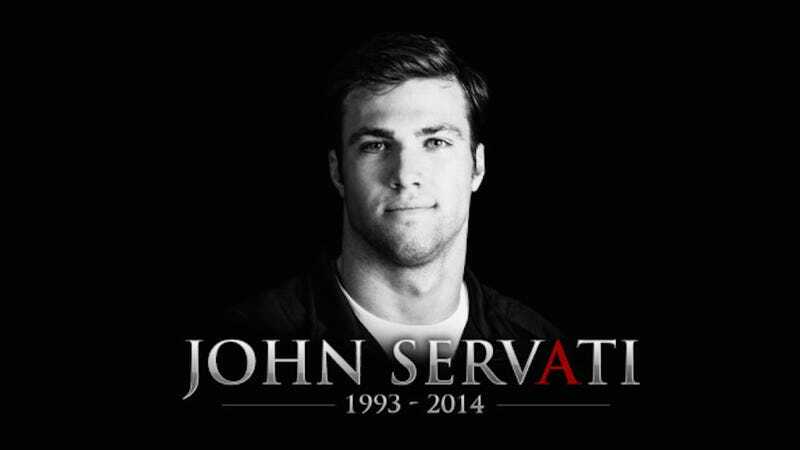 "John Servati was an extraordinary young man of great character and warmth who had a tremendously giving spirit," UA head coach Dennis Pursley said in a statement. "During this incredibly difficult time, our thoughts and prayers go out to his family and to all who had the good fortune to know him. He will forever be in our hearts and a part of the Crimson Tide legacy."